How much do Phillies suites cost? The cost of a Philadelphia Phillies suite will vary on the opponent, day of the day week and the suite details. On average, a Phillies suite at Citizens Bank Park will range from $3,750 - $8,500. As far suite pricing for concerts at Citizens Bank Park, those will vary widely depending on the event. EMC Level luxury suites will include 16 tickets and 4 VIP parking passes. Inside your Phillies suite you will have HDTVs, interior/exterior premium seating, a private restroom, entertaining area and wet bar. Guests in a Phillies suite will have plenty of in-suite catering options and a dedicated suite attendant. You will also receive private entry into Citizens Bank Park. Up to 10 additional tickets can be purchased for the suite. The 2019 Philadelphia Phillies let it be known they are in the hunt for a championship when they signed Bryce Harper to a 13-year contract, worth $330 million. The Phillies made the big splash in the offseason by acquiring Harper and hope with other offseason signings, they’ve put a team together to take on the tough NL East. Another boost to the Phillies outfield was the signing of Andrew McCutchen. Behind the plate, the Phillies made a trade with the Marlins for catcher J.T. Realmuto. If that wasn’t enough, they also traded with the Mariners to bring over shortstop Jean Segura. With the offense getting a major upgrade, the Phillies starting lineup is one of the best in the National League. In addition to the new players from the offseason, the Phillies have Rhys Hoskins, Obdubel Herrera, Maikel Franco and Cesar Hernandez. Hoskins is one of the league’s future stars and will be in the cleanup spot next to Harper and McCutchen. Manager Gabe Kapler will have power up and down this lineup. The pitching staff got a boost to their bullpen in the offseason when the Phillies signed closer David Robertson. Robertson joins a solid bullpen with guys like Hector Neris and Seranthony Dominguez. The Phillies rotation is led by Cy Young candidate Aaron Nola. Behind Nola is Jake Arrieta, Zach Eflin, Nick Pivetta and Vince Velasquez. Come see Bryce Harper at Citizens Bank Park this season. 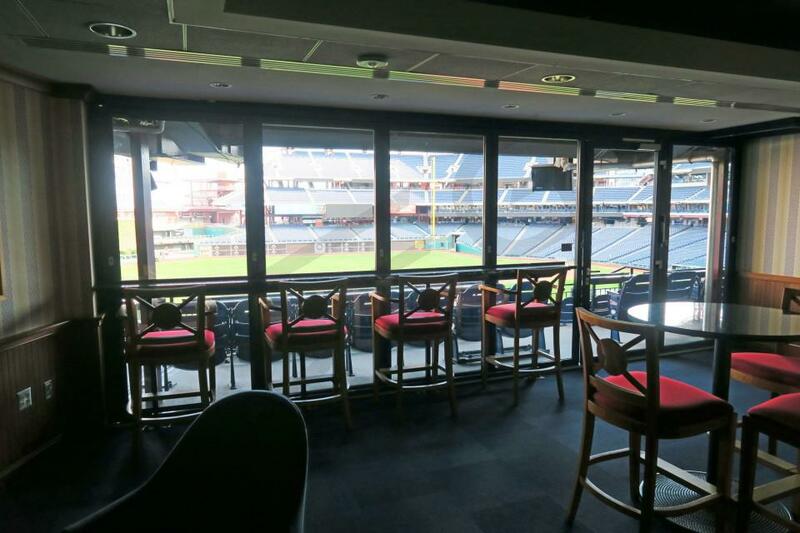 The EMC Suite Level for Phillies games offers fans a VIP experience from the parking lot to their seats. VIP Parking, premium in-suite catering options and private entry into the ballpark are just some the perks to a Phillies suite. 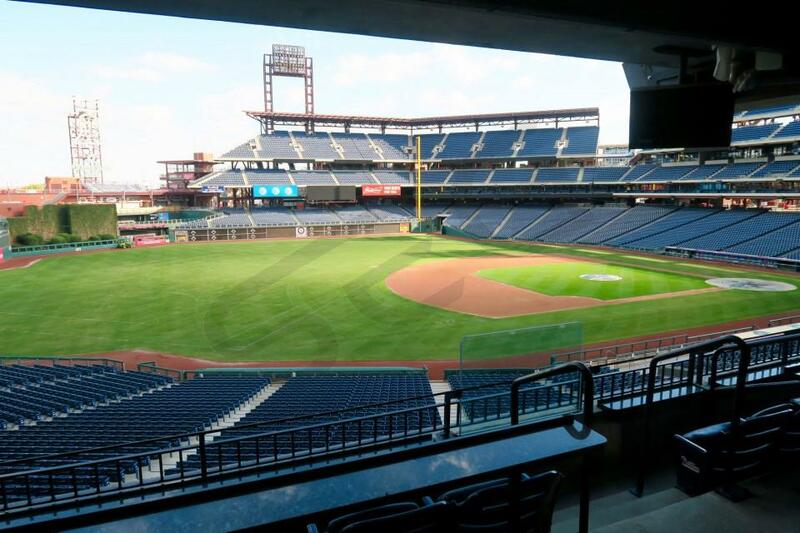 Phillies’ luxury boxes will accommodate 16 – 24 guests. All the Citizen Bank Park suites are climate-controlled for your comfort. 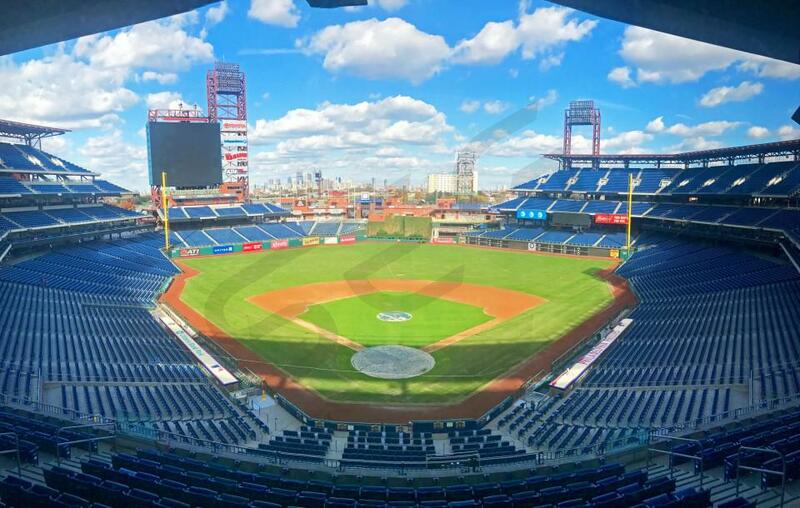 Suite prices for a Phillies game will vary on the opponent and the location of the suite on the EMC suite Level but will range from $4,000 - $8,000. The Philadelphia Phillies underwent an off-season filled with change that has led to plenty of optimism for 2018. It all starts with Gabe Kapler, the new manager of the Philadelphia Phillies. Kapler hopes to turn this young Philadelphia team into a winner. The Phillies added slugger Carlos Santana on a 3 year, $60 million contract. Santana will provide a much needed veteran presence and source of power in the middle of a very young lineup. This off-season also saw Philadelphia bring in a pair of elite middle relievers - Tommy Hunter and Pat Neshek. Both Maikel Franco and Tommy Joseph provide some pop to the Phillies lineup. With Santana now in the fold, Franco and Joseph could be due for even bigger years. Odubel Herrera has also progressed nicely as a center fielder and top of the order threat. Top prospects J.P Crawford and Jorge Alfaro will look to improve in 2018 after making their debuts last year. In 2017 Aaron Nola emerged as one of the best young pitchers in the majors. The 24-year old led the Phillies in wins, ERA, and strikeouts, and he will likely only improve from here. Behind Nola, Jerad Eickhoff and Vince Velasquez plan to solidify the Phillies starting rotation. If there is improvement in the starting rotation, the Phillies could take major strides this season. Standard luxury suites at Citizens Bank Park include 16 tickets & 4 VIP parking passes. A Phillies suite will feature premium catering options, a climate-controlled environment, comfortable seating, Wi-Fi and HDTVs. Along with a luxury box at Citizens Bank park, guests will get private entry inside the stadium and exclusive access to VIP clubs. Whether you are entertaining for business or for fun, a Phillies suite presents the perfect setting for any occasion. The Philadelphia Phillies will continue to rebuild in 2017. After finishing 71-91 in 2016, the Phillies made significant personnel moves this offseason. The Phillies will continue to build around core players OF Odubel Herrera and 3B Maikel Franco. Maikel Franco enojyed a successful first season in the Major's hitting 25 home runs. Franco boasts plus raw power and a solid glove while Herrera plays a fantastic CF and provides speed at the top of the order. Both players will look to continue their upward development in 2017. In the offseason, the Phillies aquired free agent outfielder Michael Saunders, starting pitcher Clay Bucholz and outfielder Howie Kendrick. Saunders should provide middle of the order protection for Franco. Howie Kendrick, now 33, provides a good veteran presence and is enough of a threat with the bat to keep pitchers honest. Philadelphia's offseason additions indicate ownership's committment to improvement. Phillies fans should keep an eye on the development of top prospect, SS J.P. Crawford. Crawford is widely regarded as the best shortstop prospect in baseball. Crawford plays fantastic defense and his offensive approach is maturing. Expect to see Crawford's big league debut in 2017. The Philadelphia Phillies will continue to rebuild in 2016. They finished with the worst overall record in 2015 but they were able to see what some of their young prospects can do on the major league level. New manager, Pete Mackanin, may not turn this year’s Phillies into a playoff team but they are on the right track for the future. The offseason brought in some veteran pitching in players like Jeremy Hellickson, David Hernandez and Charlie Morton. The Phillies also added to their outfield depth by getting Peter Bourjos. One of the best things to come out of 2015 was the emergence of rookie Maikel Franco. Franco looks to be a solid option at third base for years to come. Franco appears to be a hitter who has the capability of hitting over 20 home runs in 2016. Cesar Hernandez has little power but could lead the Phillies in stolen bases. Odrubel Herrera also excelled in his first year. Herrera is more of a base stealer than a power bat. Ryan Howard may end up splitting time with Darin Ruf at first base. Howard has struggled with left-handed pitching late in his career. Aaron Altherr will get a shot to be the everyday left fielder. Altherr showed some power number in the minors. The Phillies will most likely call up some of their future stars this season including shortstop J.P. Crawford. Crawford is regarded as a top prospect in all of baseball. Outfielders Nick Williams and Roman Quinn could also see time in the majors at some point. Hellickson will lead the rotation with Morton, Aaron Nola, Jerad Eickhoff and Vincent Velasquez following. Nola at times looked great in his rookie campaign last year. Nola could be the ace of the staff by the time this season ends. Eickhoff is another prospect who showed no problems striking people out in his limited starts. David Hernandez is expected to get the most save opportunities after the Phillies traded Ken Giles. Phillies luxury suites at Citizens Bank Park include 16 tickets & 4 VIP parking passes. There’s an option to purchase up to 10 tickets for the suite if necessary. A Phillies suite will feature premium catering options, a climate-controlled environment, comfortable seating, Wi-Fi and HDTVs. Along with a luxury box at Citizens Bank park, guests will get private entry inside the stadium and exclusive access to VIP clubs. Whether you are entertaining for business or for fun, a Phillies suite presents the perfect setting for any occasion. The Philadelphia Phillies finished last in the National League East in 2014. The team is committed to rebuilding their farm system and get back in contention in the future. This gives Phillies fans a chance to see of the team’s promising prospects take the field in 2015. Pitching prospect Aaron Nola, the Phillies best pitching prospect will be one of the key players for years to come. Same goes to position players Maikel Franco and J.P. Crawford. The Phillies hope these future stars can join the rest of their young talent on the MLB roster already such as Cody Asche, Cesar Hernandez and Dominic Brown. Part of the rebuilding process is dealing away some fan favorites. The Phillies traded one of the best players in Phillies’ history, Jimmy Rollins, to the Dodgers in the offseason. They also let go Marlon Byrd. Ryan Howard and Chase Utely will be leaned on heavily in the middle of the lineup. While the same goes for Cole Hamels and Cliff Lee in the pitching rotation. Phillies luxury suites at Citizens Bank Park include 16 tickets, 4 VIP parking passes, option to purchase up to 10 standing room passes, exclusive access to stadium and stadium clubs, catering options, climate-controlled environment, premium seating, and HDTV’s. 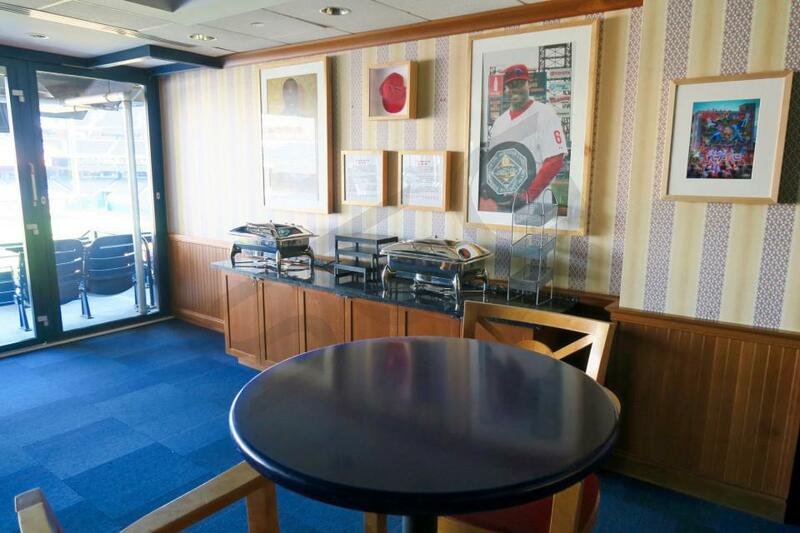 Phillies suites present the perfect setting for business or for pleasure. Thank you for signing up for specials at Citizens Bank Park. Enter your email address below to stay in touch. We'll sign you up for our newsletter, which will inform you of the latest inventory and events at Citizens Bank Park. We promise we will never sell or distribute your information. 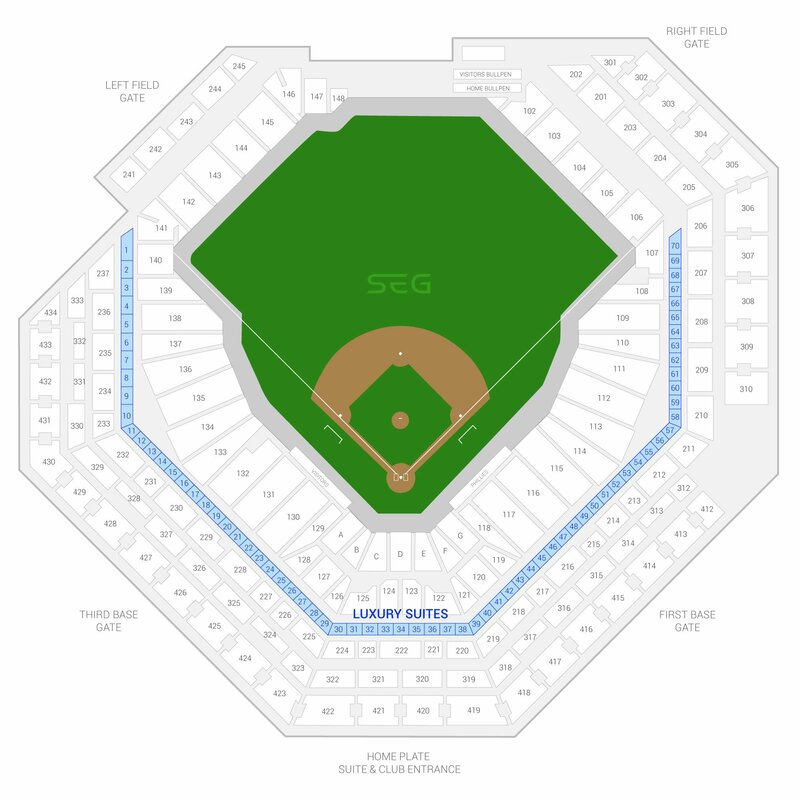 The seating chart below shows where the Philadelphia Phillies suites at Citizens Bank Park are located.